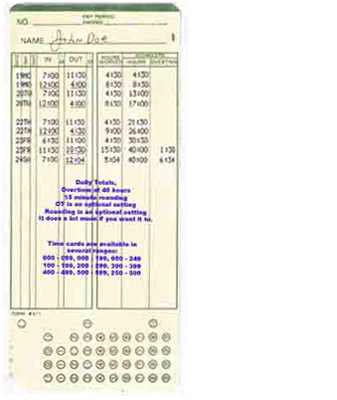 ALWAYS IN STOCK: Amano MJR7000 time cards, 2000 cards per box. We will help you update the program, over the telephone! Standard range is 000 - 099. Buffed finish, largest lettering available, anywhere! Makes your job of keeping them in order, easier. We Repair Amano MJR7000 time clocks. Quick, Reasonable, and Guaranteed! If you need faster shipping (you're out!) just call, we can do that.